For none U.K shipment please call before purchase. First, let's dispel a common, long held belief... a myth... about copper. Most of us grew up in an age of shiny copper bottomed pots and pans that had to be scrubbed and polished on a regular basis. As a result, we're conditioned to believe that copper is a high maintenance, pain in the you know what, item! But actually, quite the opposite is true... Unless you're dealing with highly polished copper pots, pans or decorative items, it's simply a myth that copper requires a lot of care. If you love the look of a warm, natural, golden brown patina, you'll be delighted to know that pure copper kitchen sinks, bathroom sinks, vessel sinks and bath tubs don't require any maintenance! Yes, you read that right... NO maintenance! The truth is... pure copper pretty much takes care of itself! Click here to find out just how easy it is to care for your copper sink or bathtub. Mother Nature has given copper a seemingly magical quality known as a 'living finish'. This very unique characteristic sets copper apart from most other metals and is the primary reason why a pure copper sink or bath tub becomes more beautiful with age! When left untreated, copper interacts with its environment and naturally deepens in color and tone over time. It begins its journey with a pinkish, salmon-like hue and very gradually darkens in color as it passes through a progression of russet browns until it finally stabilizes to a deep, rich tone. The speed at which it changes color and the final depth of tone for each copper sink or bathtub will differ and is greatly influenced by the amount and type of use it receives and by the prevailing weather patterns in your particular geographical location. The truth is... pure copper sinks and bath tubs age gracefully and become even more beautiful with every passing day! Truth #3: Copper Sinks & Bath Tubs 'Heal' Themselves! Your copper sink or bath tub will not scratch any more easily than any other fixture made for kitchen and bath. However, should you happen to scratch the surface and end up with a bright, shiny, streak somewhere on your sink or tub, you won't need to take any steps to 'fix' it. Because of copper's 'living finish' properties, your copper kitchen sink, bathroom sink or bathtub will quite literally 'heal' itself! Simply go about your normal daily routine and within a very short period of time you'll notice the scratch begin to darken and slowly blend back in with the original patina! So, the 3rd truth about copper is... pure copper will naturally 'heal' itself! Another of copper's amazing properties supports the fact that copper kitchen sinks, bathroom sinks, vessel sinks and bath tubs don't require any maintenance. And, that is... Copper is naturally antibacterial! Recent studies have shown that bacteria only lives for hours on copper, as compared to living for days on stainless steel and longer still on all other types of kitchen and bath surfaces! You can toss out all those disinfectants and antibacterial products you've got stashed under your kitchen sink! Bacteria will simply not live on copper! For more info, you may want to read these online articles about copper's antibacterial properties. (To read the articles, click on the links then use your browser's back button to return to this page). The 4th truth is... pure copper is naturally hygienic, making it ideal for your kitchen and bathroom. Truth #5: A Copper Sink & Bathtub Is Not Always A 'Copper' Sink & Bath Tub! Not all copper sinks and bath tubs are equal. The components that go in to producing a copper kitchen sink, bathroom sink, vessel sink or bathtub are critical to its quality, appearance, ease of use and longevity. They account for the difference between you loving your kitchen or bathroom sink or bath tub and... well... not loving it! Although copper has been used for nearly 10,000 years, only about 12% of the known worldwide copper resources have been mined throughout history. And, because copper is indestructible, nearly all of it is still in circulation... but mostly in 'recycled' form. When an item made of copper is discarded, it is melted down, combined with other alloys, then re-marketed in the form of recycled copper. As a result, the majority of copper on the market today is no longer pure copper. It's an 80/20 or 90/10 copper/alloy mix. And, the 'mix' portion is comprised of unknown alloys... as there is no industry standard. The vast majority of copper products in use today... copper wiring, copper tubing, copper plumbing, copper valves, copper fittings, the copper in your home appliances, in your heating and cooling system... etc, are (with the exception of copper wiring), made of recycled copper. Recycled copper contains a high enough percentage of copper for the above products to perform their primary function. And, although the alloy 'mix' in recycled copper compromises copper's luxurious look, most of these products are hidden or 'out-of-sight', so aesthetics is not an issue. pure copper...On the other hand, a kitchen sink, bathroom sink or bath tub made of copper plays a dual role in your home. It obviously must be functional, but because it is in full view at all times, it is equally important that it be aesthetically pleasing as well! Many of the copper sinks and bath tubs on the market today are made of recycled copper which is really not well suited to handle the dual role of function and beauty... the primary duties of sinks and bathtubs. Only a copper kitchen sink, bathroom sink, vessel sink or bath tub made of pure copper will truly satisfy both of these needs. here's why...Kitchen sinks, bathroom sinks and bathtubs are the absolute 'work horses' of your home. They not only have to be strong enough to withstand the demands of your busy family, they must also be easy to care for and remain beautiful in the face of constant daily use! · or, worse yet... contain an alloy that may be hazardous to your health! *note: the term pure copper refers to copper as mother nature created it... 99.9% copper! Although copper is extremely durable, it's also a very soft and malleable material. For this reason, it's crucial that your copper kitchen sink, bathroom sink, vessel sink or bath tub be constructed of the proper weight (gauge) material. 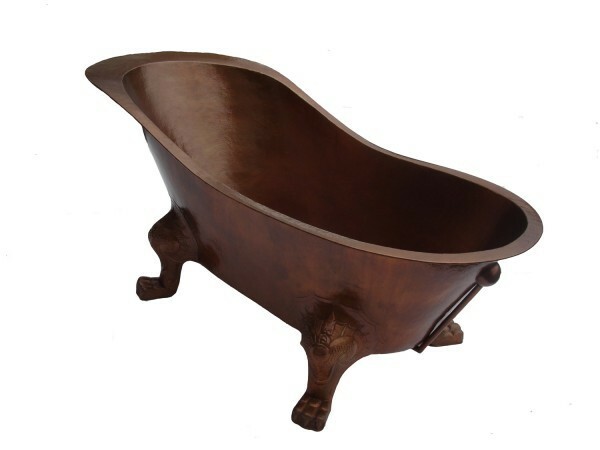 48 ounce (the equivalent of 16 gauge) copper is the minimum weight that copper sinks or bath tubs should be made of. Kitchen sinks, bathroom sinks and bath tubs made of 48 ounce copper will not dent easily, will be strong enough to meet the demands everyday use and will last for decades. Even an oversized copper kitchen sink with the added weight of a garbage disposal, or a copper bath tub with the added weight of an extra person will not require additional support when made of 48 ounce, pure copper! How will you know what weight of copper the sink or bath tub is made of? Simply make it a point to ask! If you have the advantage of physically seeing and touching the copper sink before you purchase it, here are some things to look for... First, pick up the sink and see how it feels. You will immediately know if you have a quality sink in your hands or not! Trust your instincts. A 48 ounce (16 gauge) pure copper sink, no matter how small it is, will have a 'solid' feel to it and will be heavy. It won't feel 'light as a feather'! Next, visually check the thickness of the copper. If the sink is made of copper that is paper thin, it's clearly not made of the proper weight/gauge. It will not hold up well to normal everyday use and will most likely be a huge disappointment. Joints and seams of copper sinks and bath tubs are typically joined together by using one of two different processes... welding or soldering. Of the two, soldering is a much weaker process. Joints and seams joined together in this manner have a tendency to split or break apart after a certain period of time. On the other hand, copper welding provides much greater strength. A properly welded copper kitchen sink, bathroom sink or bath tub will not experience any weakening at joints or seams, nor will joints or seams break apart even after years of constant daily use. Choose a copper sink or bath tub that has been copper-welded. Aside from the added strength a copper weld provides, welded areas are less easy to detect when the sink or bath tub is new and even much less so after the sink or bath tub has aged. You can usually tell if a copper sink or bath tub has been soldered. Soldering typically uses an alloy to join the copper seams together making the seams more visible to the eye. Also, rather than blend in with the sink over time, solder turns black as it ages, making it even more noticeable. There are a few more things to take note of when choosing a copper sink or bath tub. These items don't particularly affect the performance of your kitchen sink, bathroom sink or bath tub, but they do have a direct impact on overall appearance. And, they're further indications of quality. First, notice the hammered detailing. Is it perfectly uniform or more irregular? If it's uniform, it was most likely made by a machine. Hand hammered patterns are irregular in depth, size and texture. They add more character to a copper sink or bathtub and are a part of what gives it a distinctly original look. Next, notice the edges around the rims of sinks and bath tubs and along the bottom of the apron on the front of a farmhouse kitchen sink. Are they sharp, ragged and uneven? Or are they smooth to the touch, even in size and adequately curved under for a more finished, 'polished' look? Aside from checking the rim along the bottom of the apron on a copper farmhouse kitchen sink, be sure to note whether or not the apron itself has adequate support. If it's not properly supported, the apron front could eventually loose its shape and become somewhat curved or rippled due to the weight of your body leaning up against it many times a day when doing the dishes and preparing a meal. And, finally... what about the patina finish? Granted, it will be uneven... that's the nature of the process. But, does it appear to have been applied as expertly and evenly as possible? Or does it look as if it was sloppily wiped over the surface of the sink or bath tub and remains blotchy or streaked? These are just a few of the many elements involved in the production of copper sinks and bath tubs. Working in unison, they play a big role in determining the quality, appearance and longevity of a copper kitchen sink, copper bathroom sink and copper bath tub. Know the type and weight of the copper that's used in the sink or bath tub you purchase. And notice how the sink or bath tub is constructed and completed. Your level of satisfaction with your copper sink or copper bath tub will most certainly be dependent on it! Above all else, remember this most important truth... not all copper sinks and copper bath tubs are created equal! On occasion, we have playfully stated that our copper sinks and bath tubs could very well be the archeological treasures of some future civilization! But when you consider that a museum at the University of Pennsylvania displays a (pure) copper frying pan that has been dated to be more than 50 centuries old, our playful statement may not be too far from the truth! With just a minimum of care and assuming it's made of high grade materials, your copper kitchen sink, bathroom sink or bath tub could very well last for centuries too, and be used and enjoyed by your grandchildren's, children's, children... and beyond! The truth is... copper sinks and bath tubs are more than just beautiful and practical. They're extremely resilient, cannot be destroyed and will last for generations! Truth #7: You Will Love Your Copper Sink & Bath Tub! 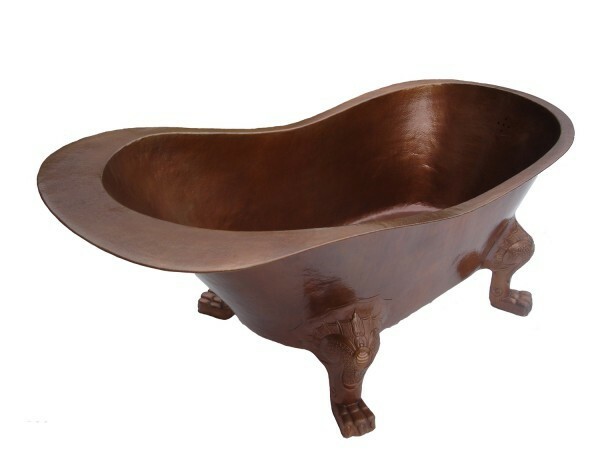 You will be absolutely thrilled with a high quality copper kitchen sink, bathroom sink, vessel sink or bath tub. It will fill your home with love, beauty and joy... make you the envy of your friends and neighbors... and dramatically set you, and your home, apart from the ordinary! Copper sinks and bathtubs that meet or exceed the above recommendations will always be attractive, durable, hygienic (antibacterial), resistant and easy to care for. What's more, they will age gracefully, last for lifetimes and become even more beautiful through the years! Nothing feels more wonderful than to be surrounded by beauty! Especially in your very own home! Your copper sink and copper bath tub will give you this experience every single day of the year! This 7th truth about copper is much more personal than all of the others. And, the truth is... You will LOVE living with copper! Now you have some guidelines, 'truths' if you will, to choosing the perfect copper sink and copper bathtub. Keep these in mind when purchasing your copper sink and bathtub and you will have a beautiful kitchen or bathroom fixture that will give you years of unequalled enjoyment!